Noted columnist and commentator E.J. Dionne, Jr. (left) will present a public lecture Sept. 27 on American religion, inequality and populism, the culmination of a day of events honoring Candler emeritus professor Jon P. Gunnemann (right). Noted columnist and commentator E.J. Dionne, Jr. will give a public lecture titled, “Can We Do Justice and Love Mercy in Politics? 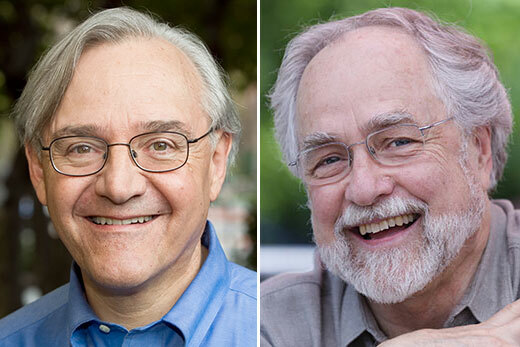 American Religion, Inequality, and Populism,” at 7:30 p.m. Thursday, Sept. 27 at Glenn Memorial Auditorium on the Emory campus. Dionne’s lecture is the culmination of a day of events honoring Jon P. Gunnemann, Professor Emeritus of Social Ethics at Candler School of Theology. The events will reflect Gunnemann’s research interests with a focus on religious perspectives on economic inequality. Prior to the lecture, a panel discussion on “Spirit and Capital in an Age of Inequality” will be held from 3:00 to 5:00 p.m. in Room 360 of Candler. Panelists will include Elizabeth M. Bounds, associate professor of Christian ethics; Timothy P. Jackson, professor of Christian ethics; Ted A. Smith, associate professor of preaching and ethics; Douglas A. Hicks, dean of Oxford College of Emory University and William R. Kenan Jr. Professor of Religion; Julie Meadows 08G, developmental editor of The Generous Reader; and Robert P. Jones 02G, CEO of the Public Religion Research Institute (PRRI). Laney Professor of Moral Leadership Robert M. Franklin Jr. will serve as facilitator. Gunnemann will offer remarks at the end of the panel. The panel shares the name of a recent Festschrift in honor of Gunnemann, “Spirit and Capital in an Age of Inequality,” co-edited by Ted Smith and Robert Jones, with Dionne, Bounds, Jackson and Meadows all serving as contributors. No registration is required to attend the panel. Dionne, a senior fellow at the Brookings Institution, is a syndicated columnist for the Washington Post and university professor in the Foundations of Democracy and Culture at Georgetown University. A nationally known political commentator, he appears weekly on National Public Radio and regularly on MSNBC. He has authored or co-edited more than 10 books, including his most recent, “Why the Right Went Wrong: Conservatism—From Goldwater to Trump and Beyond.” Dionne has received numerous awards, including the American Political Science Association’s Carey McWilliams Award to honor a major journalistic contribution to the understanding of politics. Gunnemann taught at Candler from 1981 until his retirement in 2008, focusing on theology, ethics and the economy, and on contemporary theories of justice. He served as director of Emory’s Graduate Division of Religion from 1992 until 1998. He has written extensively on issues of economic ethics and on Christian ethics and social theory. The events are sponsored by Candler, the Laney Graduate School and Graduate Division of Religion, and the Center for the Study of Law and Religion. Candler is located on the campus of Emory University, at 1531 Dickey Drive, Atlanta, GA 30322. Glenn Memorial United Methodist Church is located on the campus of Emory University, at 1660 North Decatur Road, Atlanta, GA 30307.